I'm not sure how or where I met Caroline Preston, except I've known and loved her for a long time. 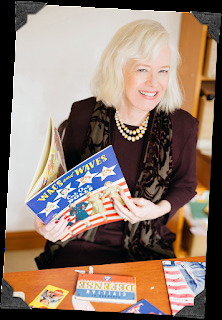 She's is the author of three previous novels, Jackie by Josie (a New York Times Notable Book), Lucy Crocker 2.0, and Gatsby’s Girl, and her first scrapbook novel, The Scrapbook of Frankie Pratt. 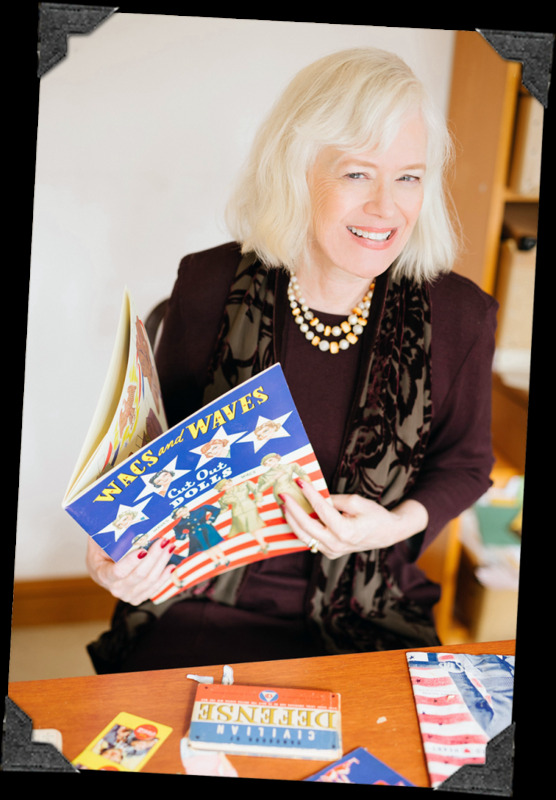 She has collected antique scrapbooks since she was in high school, and has worked as an archivist at the Peabody/ Essex Museum and Harvard University. Her latest book, THE WAR BRIDE'S SCRAPBOOK is both a fascinating exploration of a long gone time, and a very personal narrative that reads like a novel. I loved it, I love Caroline, too. This is your second scrapbook novel. What first gave you the idea of creating a novel in the form of the scrapbook? I like to say that the idea of making a scrapbook novel was 40 years in the making. As a little girl, I used to pore over my grandmother’s flapper scrapbook filled with dance cards, ocean liner tickets, and even long curls snipped when she got her hair bobbed. My first three novels were what I guess you’d call “conventional” format—i.e. just words. My third novel Gatsby’s Girl was inspired by the meticulous scrapbook F. Scott Fitzgerald kept about his first love, Ginevra King. Later he would turn the story of his unrequited crush into The Great Gatsby. When I was casting around for the idea for my fourth novel, I wanted to create something that was as visual and powerful as a scrapbook. And then I had a crazy idea—why not make a novel that WAS a scrapbook. Not a digital scrapbook, but an actual one made of real stuff that I cut up with scissors and pasted together with glue. And so I created The Scrapbook of Frankie Pratt. 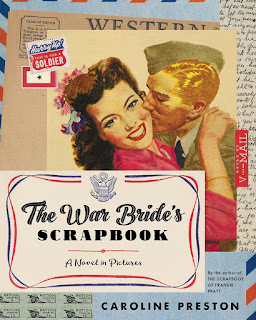 The War Bride’s Scrapbook is a scrapbook kept by a young bride while her husband fighting overseas. What inspired you to make a WWII era scrapbook? I have a large collection of vintage scrapbooks. Some of the most fascinating ones are the scrapbooks kept by wives while their husbands were overseas during WWII. They are an odd combination of touching love letters, cheerful home front memorabilia such as ration stamps, grim war clippings about battles and casualties, and military souvenirs such as dog tags and discharge papers. 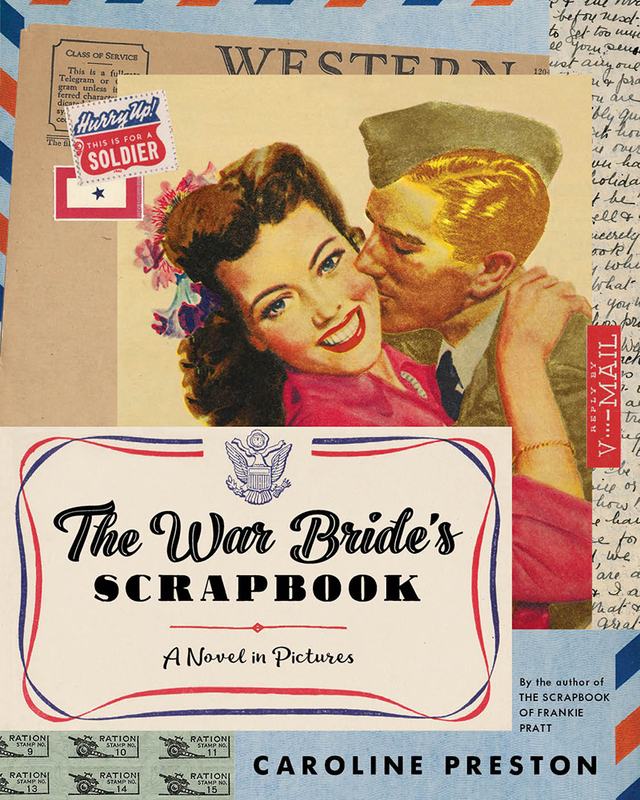 These “bride’s scrapbooks” provide an interesting glimpse into the reality of wartime marriages. Many couples had gotten married only a few weeks after they’d met and then were separated for years. Letters were often their only means for getting to know one another and forming an actual relationship. The scrapbooks kept by war brides are often sweetly hopeful and aspirational. They draw an idealized image of what their marriage and life will be like when their husbands return from war-- babies, new houses, new appliances and cars, domestic routines and jobs picked up again. Most WWII scrapbooks tend to end abruptly in August, 1945 with headlines about the atomic bombs. It seems like the scrapbooks were put away, never to be looked at again until they turned up on eBay. We don’t know what happened when (or if) the husbands returned home after the war. In The War Bride’s Scrapbook, I’ve tried to write the whole story behind one of these bride’s scrapbooks. Why the bride (Lila Jerome) started to keep it in 1943, why she stopped keeping it in 1945. And what truths her daughters discover about their mother when they find the scrapbook 70 years later. Are Lila Jerome and Perry Weld based on your own parents? Not at all. My father was 4-F because of terrible eyesight and spent the war in San Diego as a Navy Jag throwing drunken sailors in the brig. My parents didn’t get married until 1947. But Lila and Perry’s story was inspired in part by real people and real events. My last surviving WWII-generation relative, an aunt, dropped out of Vassar at 20 to marry her college boyfriend before he shipped out. She wrote me some very candid emails about how she came to regret her wartime marriage almost immediately but felt economically and socially obligated to stick it out for 20 miserable years. I had Perry serve with the much-decorated 291st Engineer Combat Battalion. The 291st managed to halt Nazi assault in the Battle of the Bulge by blowing up bridges. It also built the first tactical bridge across the Rhine River. How did you go about creating Lila’s scrapbook? The War Bride’s Scrapbook turned out to be a much more complicated and time-consuming undertaking than I originally imagined. I spent four years collecting WWII ephemera and doing research. I was fortunate to interview several WWII veterans including combat engineers and the author James Salter. Many friends shared caches of their parents WWII letters, and I research 291 Combat Engineer records at the National Archives. I went to WWII reenactments and befriended combat engineer reenactors who educated me about supplies and equipment used in the European Theatre. My husband and I toured sites visited by US combat engineers including Normandy. I interviewed orthopedic surgeons and trauma doctors about Perry’s war wound and recovery. Are the items in the scrapbook original or are the images from the web? Almost all the items in the book are original. I collected hundreds of WWII-era publications and objects to create my scrapbook. My office looks like something out of the Hoarders show. The primary sources that I started out with were magazines from 1940-1946. Life and Time provided a weekly timeline of war headlines and everyday life on the home front. Women’s magazines (McCall’s, Ladies Home Journal) were chock full of wartime illustrations, advice columns, fashion spreads, and ads. I collected boxes of V-mail stationery, picture postcards and telegram paper for Lila’s and Perry’s correspondence. I assembled all the “scraps” that a bride in the 1940’s would glue in a scrapbook: menus, movie tickets, ration stamps, book jackets, train timetables, war bonds, maps, and matchbooks. Where’d you find all this stuff? A lot of oddball places. A retired couple down the road from me in Charlottesville had built an entire Home Front museum in the basement of their ranch house and lent me things from their collection, such as the French phrasebook. One of my favorite vintage stores is Whiting’s Old Paper in Mechanicsville, Va. which has over one million pieces of ephemera. There is a huge military flea market at the annual Battle of the Bulge reenactment. (Yes, such an event really happens--in January in the Pennsylvania woods!) And I was almost always able to track down something I needed on eBay—from a knitting pattern for GI sweaters to 1946 Chevy manual. I got so many packages my mailman started to complain. How does a scrapbook create a different narrative of World War II than a conventional novel? I really see The War Bride’s Scrapbook as containing three separate narratives. The first is the story of Lila and Perry’s marriage, told through Lila’s captions and their letters. The second is a timeline of the war from Pearl Harbor to J-V day told through magazine articles and newspaper headlines. The third is a social and cultural history of the WWII era revealed in magazine art and ads. Cigarette, girdle, and appliance ads tell us as much about the role and expectations of a wartime bride as a 300-page novel. Without giving anything away, I have to tell you that the ending gobsmacked me. I was weeping and shocked and yet, it felt like the exactly right ending. Did you always know it would be that way? When I started the scrapbook, I didn’t know how Lila’s and Perry’s story would end after the war and I struggled over it for almost 3 years! I found my ending in the WWII letters of some of my friends’ fathers. These were men I had known growing up—silent, remote, strict 1950’s dads. In their letters, I saw glimpses of their younger selves—full of passion and optimism—that had been extinguished by war. They were probably suffering from undiagnosed PTSD. I was also inspired by James Salter’s description of a reunited wartime couple--What would they be like now…? ..there was the power of all the letters, of being apart, the denied love that reality cannot equal. The addition at the end of the American Studies material is also pure genius, and I think could be used to study this book , and it asks the question, what really is the truth? Is it the artifacts we leave behind? The stories? Or how we choose to tell them? Lila’s scrapbook is an ahistorical artifact, like a diary. It’s found by her daughters after her death and it upends everything they knew, or thought they knew, about their parents. 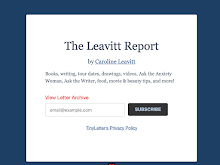 I had a lot of fun writing the daughter’s email and interview at the end. She has the same smug, know-it-all tone that I once used with my mother!